The Barclays UK Property Predictor in May revealed property prices will rise by 6.1% on average every year until 2021 driven by buy-to-let investors and high net worth millennial investors. Concurrently Nationwide’s HPI reported a fall in prices for the third month in a row in May for the first time since 2009 suggesting the market could come under pressure in 2017 against a backdrop of weakening consumer spending. In annual terms prices were 2.1% higher suggesting a cooling market. A difference of views of this nature creates the landscape where surveyors enjoy rolling their sleeves up to add their local expertise to the valuation process. The combination of technology and professional skills combining to best effect. Many surveying firms we speak to are reporting busy diaries right now. However, historically the survey & valuation market has seen service levels impacted when even a minor uplift in work hits it. 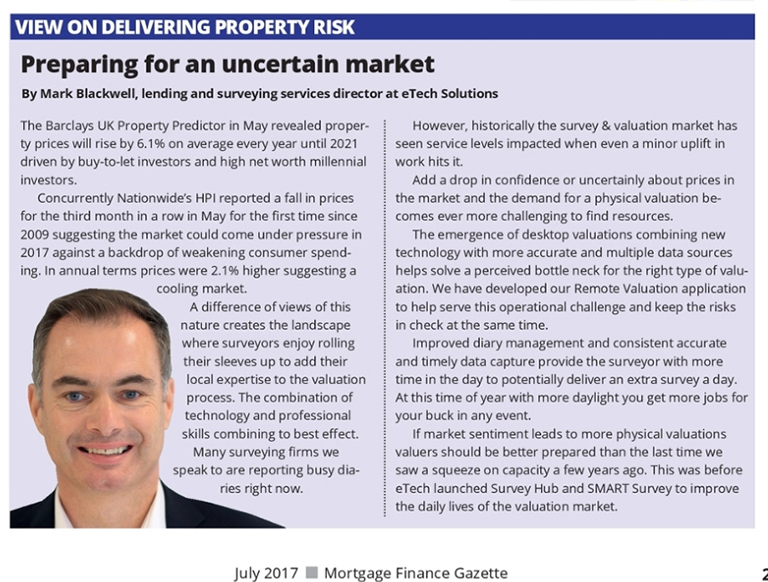 Add a drop in confidence or uncertainly about prices in the market and the demand for a physical valuation becomes ever more challenging to find resources. The emergence of desktop valuations combining new technology with more accurate and multiple data sources helps solve a perceived bottle neck for the right type of valuation. We have developed our Remote Valuation application to help serve this operational challenge and keep the risks in check at the same time. Improved diary management and consistent accurate and timely data capture provide the surveyor with more time in the day to potentially deliver an extra survey a day. At this time of year with more daylight you get more jobs for your buck in any event. If market sentiment leads to more physical valuations valuers should be better prepared than the last time we saw a squeeze on capacity a few years ago. This was before eTech launched Survey Hub and SMART Survey to improve the daily lives of the valuation market.